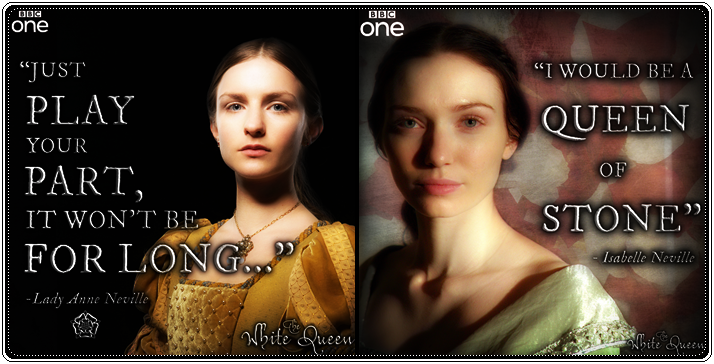 Lady Anne (Faye Marsay) and Lady Isabel (Eleanor Tomlinson) in “The White Queen”. To those of you watching “The White Queen”, please take some time to read this blog about THE REAL Ladies Isabel and Anne. You would be surprised that they are NOTHING like the show has portrayed them. They also didn’t constantly get b’ed out by the queen. ”political conniving”; “charismatic”; “self-centered”; “arrogant”; “man of moderate military skill”; “merciless”; “exploit”; “had no need to hold [his daughters] in esteem”; “hankering for supremacy and clout”; the only loyalty he held was to himself”; “enmesh in his pursuit for power”; “ego”; “narcissism”; “heedless”; “used his youngest daughter”; “spider web of intrigue”; “hopeless machinations”; “fanaticism for prestige and importance”.